A message of mercy and hope God is most Merciful God is most Forgiving Repentance facilitates forgiveness Conditions of Repentance The Promised Messiah (as) says Funeral prayers July 18 th, 2014 These verses have a beautiful message for every such person who wishes for God’s Mercy and Forgiveness for having committed sins and is fearful of His punishment. Allah, the Exalted, says, “O My servants despair not My mercy. I am the Master and possess the Power to forgive your sins and wrap you in the raiment of My Mercy. ” What a beautiful message and how it lifts our hopes and does away with hopelessness. Hopelessness is a sin; as hopelessness often becomes the cause of weakness and leads to failures. But hopelessness and failures cannot approach the one who comes under the Mercy of Allah, the Exalted. A message of mercy and hope God is most Merciful So He forgives those evil deeds that you do out of ignorance. God is most Forgiving Repentance facilitates forgiveness So you should turn your attention towards reforming yourselves and you should know that God is indeed Most Forgiving and Ever Merciful. 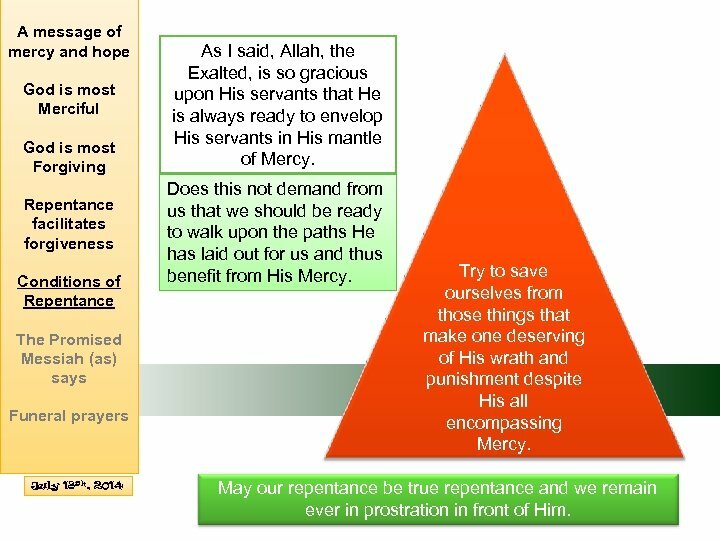 Conditions of Repentance The Promised Messiah (as) says Funeral prayers July 18 th, 2014 And not only this that He is Most Forgiving and Ever Merciful, but He says: My mercy encompasses all things. . . [7: 157] This Mercy reaches even those who do not believe; He can and does forgive all sins. 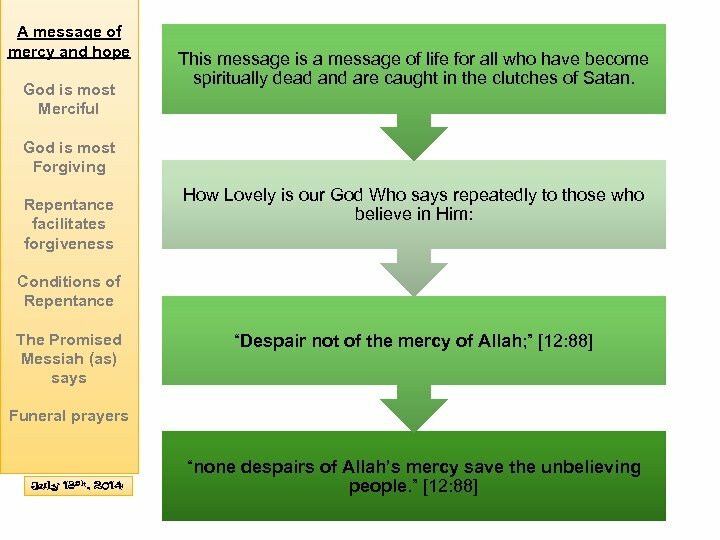 A message of mercy and hope God is most Merciful The Islamic philosophy is that no one, no person is beyond reformation. God is most Forgiving Repentance facilitates forgiveness No matter how far gone the situation of a person may be, reform is still possible. 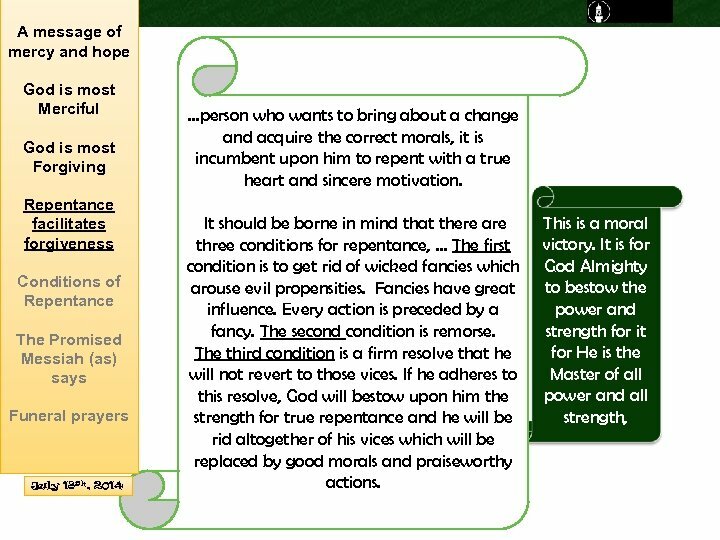 Conditions of Repentance The Promised Messiah (as) says Funeral prayers July 18 th, 2014 Everyone can be reformed. Everyone can gain benefit of the Mercy of God Almighty so long as he tries truly to purify his heart and actions. 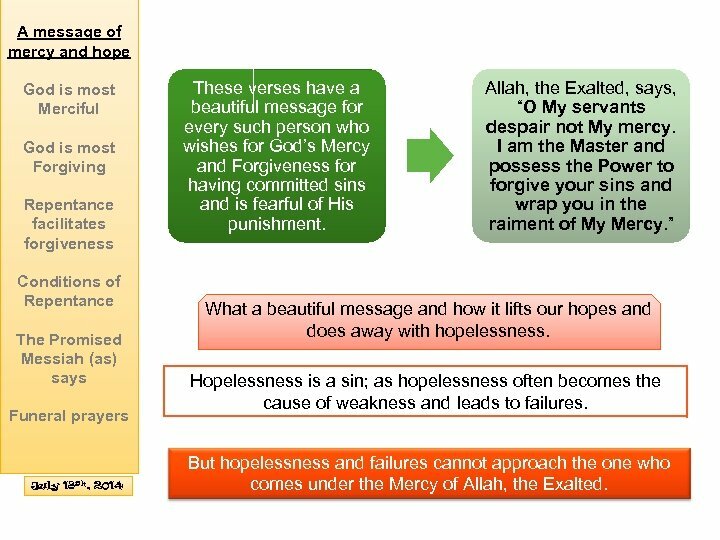 A message of mercy and hope God is most Merciful Allah, the Exalted, is the Master. He forgives. This attribute of His encompasses all His other attributes. He forgives and He shows Mercy. God is most Forgiving Repentance facilitates forgiveness This is His Mercy that despite the innumerable excesses and wrongs committed by man He does not hurry to punish. 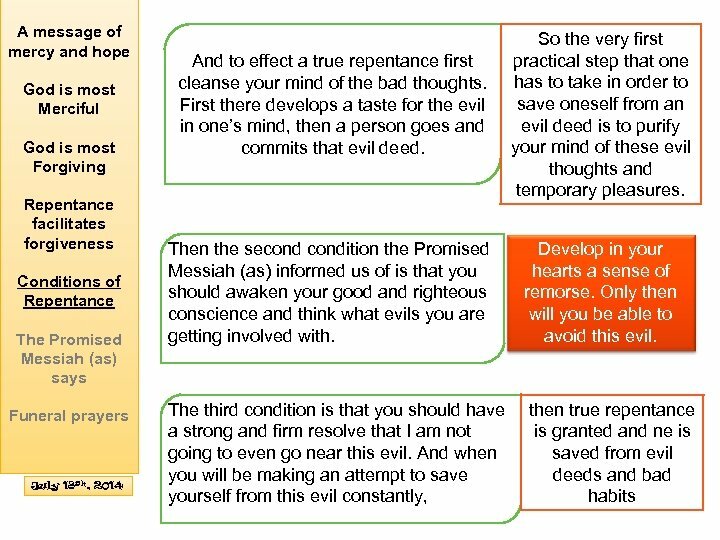 Conditions of Repentance The Promised Messiah (as) says Funeral prayers July 18 th, 2014 But, yes, it is true that because of committing excesses beyond the limit and then being obstinate, Allah, the Exalted, says that you will receive punishment. But even then Allah, the Exalted, is so Gracious, that a time will come when this punishment (the Hell) will become empty. This is how expansive and unlimited God’s Mercy is. 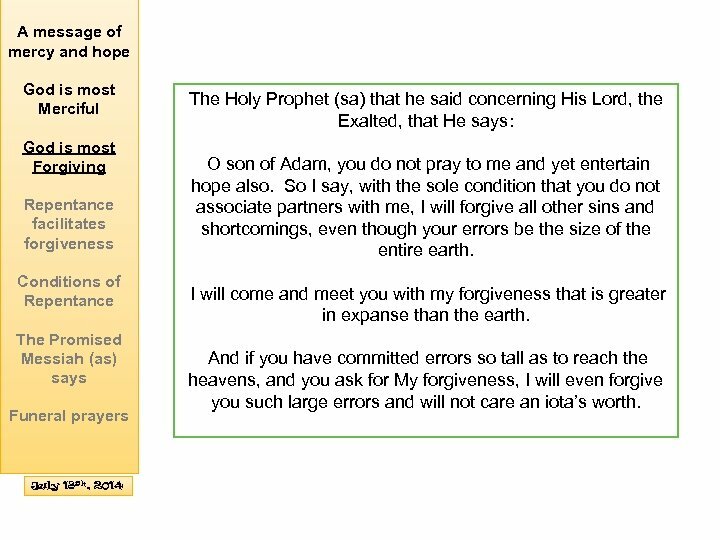 A message of mercy and hope God is most Merciful God is most Forgiving Repentance facilitates forgiveness Conditions of Repentance The Promised Messiah (as) says Funeral prayers July 18 th, 2014 The Holy Prophet (sa) that he said concerning His Lord, the Exalted, that He says: O son of Adam, you do not pray to me and yet entertain hope also. So I say, with the sole condition that you do not associate partners with me, I will forgive all other sins and shortcomings, even though your errors be the size of the entire earth. I will come and meet you with my forgiveness that is greater in expanse than the earth. And if you have committed errors so tall as to reach the heavens, and you ask for My forgiveness, I will even forgive you such large errors and will not care an iota’s worth. 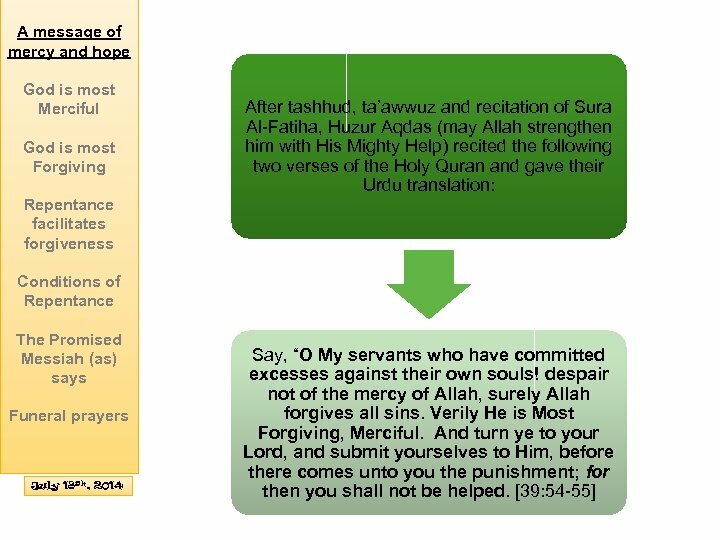 A message of mercy and hope God is most Merciful God is most Forgiving Repentance facilitates forgiveness Conditions of Repentance The Promised Messiah (as) says Funeral prayers July 18 th, 2014 A narration about God’s Forgiveness during the month of Ramadhan reads as follows: The Holy Prophet (pbuh) said that Allah has made the keeping of the fasts in the month of Ramadhan obligatory upon you and I have initiated its establishment for you. So whosoever, keeps these fasts with the intention of winning reward from Allah and having full faith – he will become as free of sins as the day his mother had given him birth. He becomes like a newborn child. Our God is more loving and forgiving towards us even than our own parents. And our God is He Who comes running towards us so that He may forgive the sins of His servants. 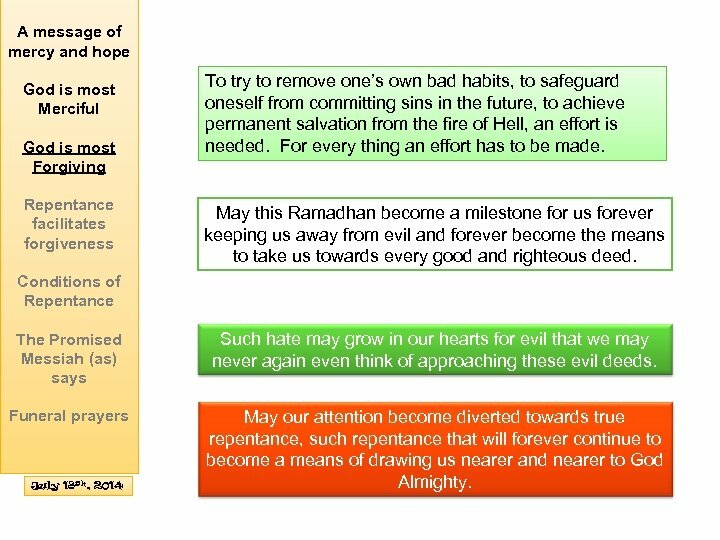 A message of mercy and hope God is most Merciful God is most Forgiving Repentance facilitates forgiveness Conditions of Repentance The Promised Messiah (as) says Funeral prayers July 18 th, 2014 Salman (ra) narrates that the Holy Prophet (sa) addressed us on the last day of the month of Shabaan and said: O people, a grand blessed month is about to commence. In it is a night which is better than a thousand months. Allah has made the keeping of the fasts of this month obligatory upon you, and made its nights for offering the voluntary prayers. 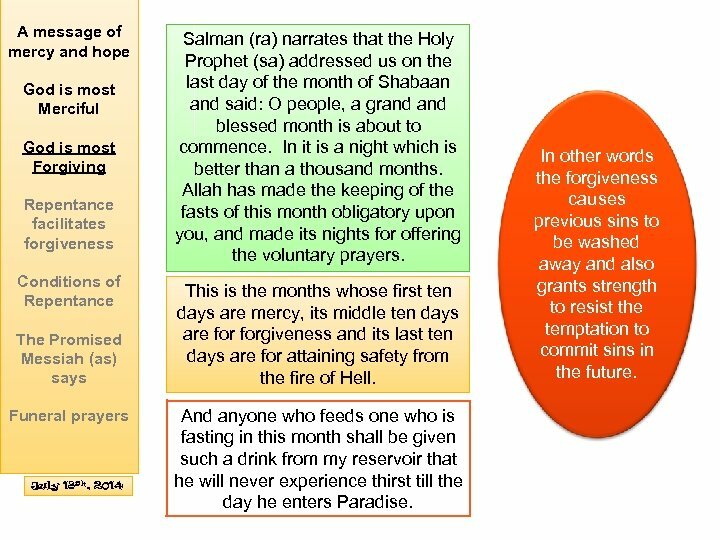 This is the months whose first ten days are mercy, its middle ten days are forgiveness and its last ten days are for attaining safety from the fire of Hell. And anyone who feeds one who is fasting in this month shall be given such a drink from my reservoir that he will never experience thirst till the day he enters Paradise. In other words the forgiveness causes previous sins to be washed away and also grants strength to resist the temptation to commit sins in the future. A message of mercy and hope So it is clear that Allah, the Exalted, is making arrangements for us at every step that take us to Paradise. God is most Merciful God is most Forgiving Repentance facilitates forgiveness Conditions of Repentance The Promised Messiah (as) says We are passing through the month of Ramadhan these days and the second ten days of Ramadhan is coming to an end and the third period of ten days is about to commence tomorrow or the day after. And this period is full of blessings from this point of view also that, as stated in the hadith, there is a night in this period that is the Night of Destiny, the lailatul qadar. This night is a great means for seeing the signs of the acceptance of prayer, and drawing a servant of God as close as possible to God. Funeral prayers July 18 th, 2014 So let us take particular care to perfect our prayers and worship in this last ten day period of Ramadhan. 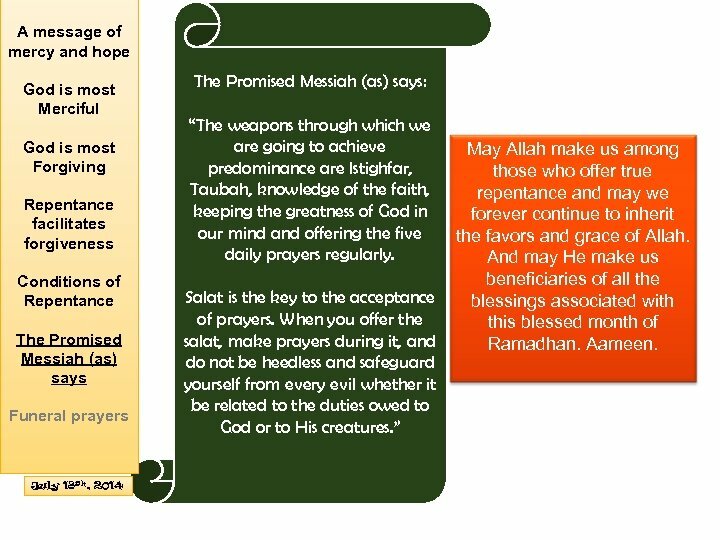 A message of mercy and hope God is most Merciful God is most Forgiving Repentance facilitates forgiveness Conditions of Repentance The Promised Messiah (as) says Funeral prayers July 18 th, 2014 How can one gain true repentance which should always keep us away from sin? 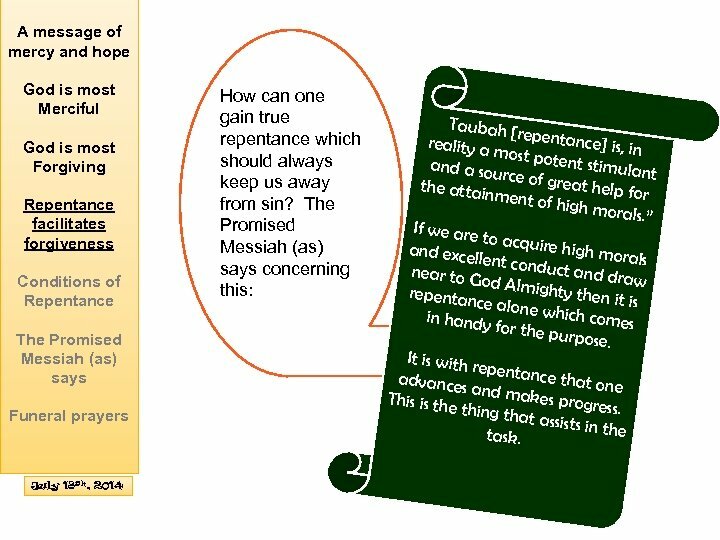 The Promised Messiah (as) says concerning this: Taubah [ repentan ce] is, in reality a most pot ent stimu and a sou lant rce of gre at the attain ment of h help for igh mora ls. ” If we are to acquir eh and exce llent cond igh morals uct near to G od Almig and draw hty then repentan it is ce alone which com in handy es for the pu rpose. It is with repentan ce t advances and mak hat one es progre This is the ss. thing tha t assists in the task. A message of mercy and hope God is most Merciful God is most Forgiving Repentance facilitates forgiveness Conditions of Repentance The Promised Messiah (as) says Funeral prayers July 18 th, 2014 As I said, Allah, the Exalted, is so gracious upon His servants that He is always ready to envelop His servants in His mantle of Mercy. Does this not demand from us that we should be ready to walk upon the paths He has laid out for us and thus benefit from His Mercy. Try to save ourselves from those things that make one deserving of His wrath and punishment despite His all encompassing Mercy. May our repentance be true repentance and we remain ever in prostration in front of Him. 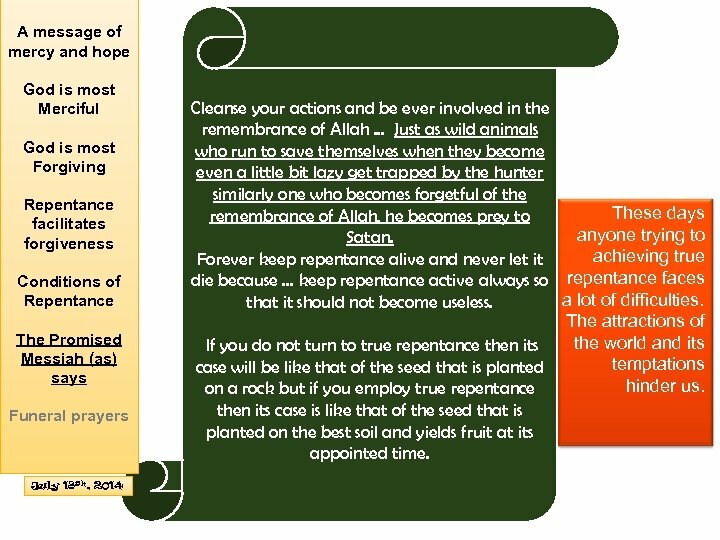 A message of mercy and hope God is most Merciful God is most Forgiving Repentance facilitates forgiveness Conditions of Repentance The Promised Messiah (as) says Funeral prayers July 18 th, 2014 Cleanse your actions and be ever involved in the remembrance of Allah. . . Just as wild animals who run to save themselves when they become even a little bit lazy get trapped by the hunter similarly one who becomes forgetful of the These days remembrance of Allah, he becomes prey to anyone trying to Satan. achieving true Forever keep repentance alive and never let it die because … keep repentance active always so repentance faces a lot of difficulties. that it should not become useless. The attractions of the world and its If you do not turn to true repentance then its temptations case will be like that of the seed that is planted hinder us. on a rock but if you employ true repentance then its case is like that of the seed that is planted on the best soil and yields fruit at its appointed time. A message of mercy and hope God is most Merciful God is most Forgiving Repentance facilitates forgiveness Conditions of Repentance The Promised Messiah (as) says Funeral prayers July 18 th, 2014 The Promised Messiah (as) says: “The weapons through which we are going to achieve predominance are Istighfar, Taubah, knowledge of the faith, keeping the greatness of God in our mind and offering the five daily prayers regularly. Salat is the key to the acceptance of prayers. When you offer the salat, make prayers during it, and do not be heedless and safeguard yourself from every evil whether it be related to the duties owed to God or to His creatures. ” May Allah make us among those who offer true repentance and may we forever continue to inherit the favors and grace of Allah. And may He make us beneficiaries of all the blessings associated with this blessed month of Ramadhan. Aameen. He was martyred on July 14, 2014; shot in the head by assailant on motorcycle. The family of this martyr was introduced to Ahmadiyyat in 1935 through his grandfather. Muhammad Imtiaz Ahmad Sahib He served as President of his Halqa [local area]. Secretary Tehrik-e-Jadid. Secretary Islah o Irshad. Qaid Khuddamul Ahmadiyya He spoke softly and possessed a simple, cool temperament and he was ever ready to forgive. On the day of his martyrdom, , he had prepared packages of rations for the needy by mid-day and had delivered them to seven houses. 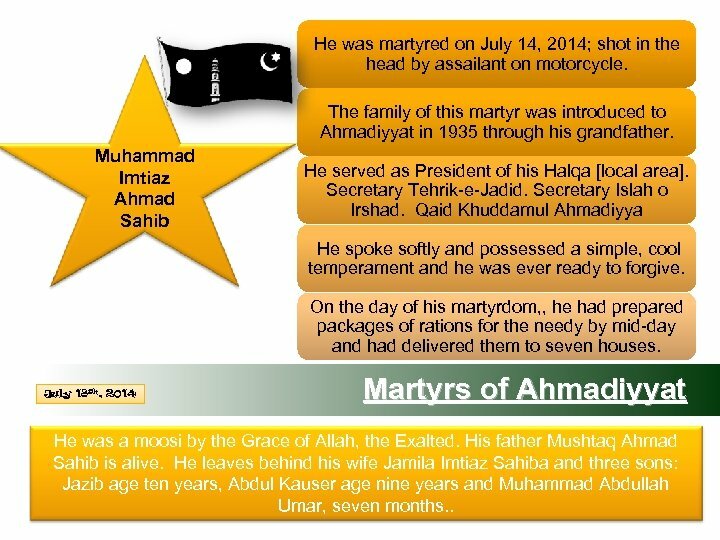 July 18 th, 2014 Martyrs of Ahmadiyyat He was a moosi by the Grace of Allah, the Exalted. His father Mushtaq Ahmad Sahib is alive. He leaves behind his wife Jamila Imtiaz Sahiba and three sons: Jazib age ten years, Abdul Kauser age nine years and Muhammad Abdullah Umar, seven months. . 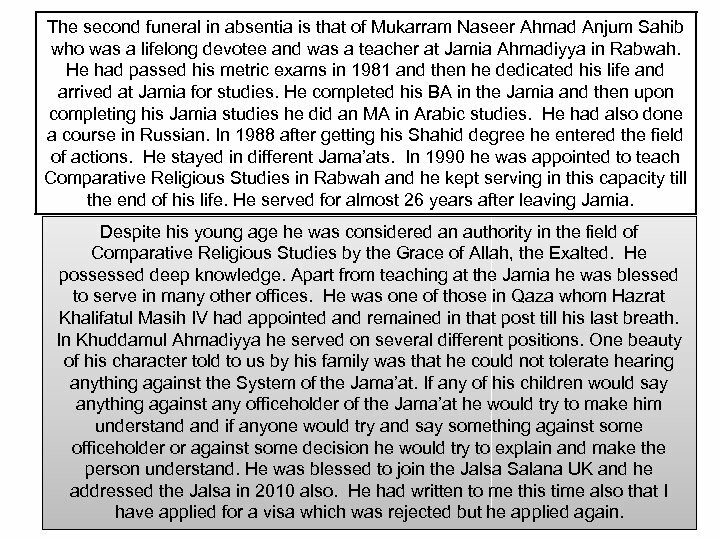 The second funeral in absentia is that of Mukarram Naseer Ahmad Anjum Sahib who was a lifelong devotee and was a teacher at Jamia Ahmadiyya in Rabwah. He had passed his metric exams in 1981 and then he dedicated his life and arrived at Jamia for studies. He completed his BA in the Jamia and then upon completing his Jamia studies he did an MA in Arabic studies. He had also done a course in Russian. In 1988 after getting his Shahid degree he entered the field of actions. He stayed in different Jama’ats. In 1990 he was appointed to teach Comparative Religious Studies in Rabwah and he kept serving in this capacity till the end of his life. He served for almost 26 years after leaving Jamia. Despite his young age he was considered an authority in the field of Comparative Religious Studies by the Grace of Allah, the Exalted. He possessed deep knowledge. 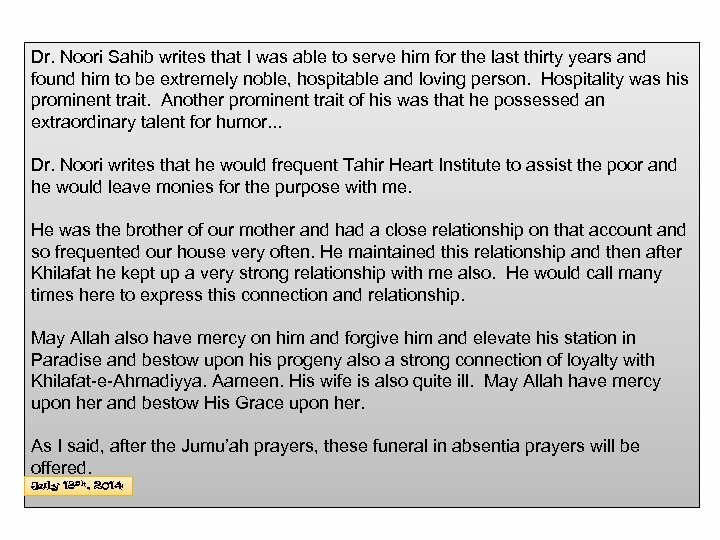 Apart from teaching at the Jamia he was blessed to serve in many other offices. 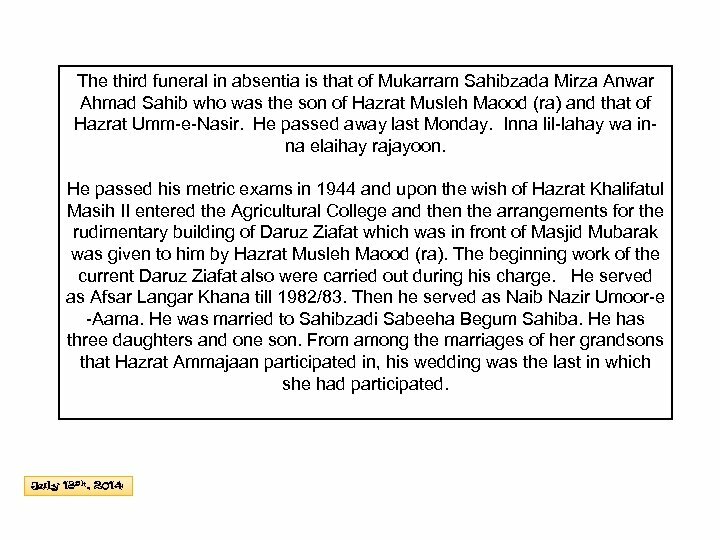 He was one of those in Qaza whom Hazrat Khalifatul Masih IV had appointed and remained in that post till his last breath. In Khuddamul Ahmadiyya he served on several different positions. One beauty of his character told to us by his family was that he could not tolerate hearing anything against the System of the Jama’at. If any of his children would say anything against any officeholder of the Jama’at he would try to make him understand if anyone would try and say something against some officeholder or against some decision he would try to explain and make the person understand. He was blessed to join the Jalsa Salana UK and he addressed the Jalsa in 2010 also. He had written to me this time also that I have applied for a visa which was rejected but he applied again.